The blanket, much-repeated refrain that eating well is prohibitively expensive is, fortunately, wrong. The latest example to disprove this myth involves delicious, nutritious cheddar cheese—made from milk from grass-fed cows—that I bought at Whole Foods. Back to the cheese. I paid $2.84 for a 7-ounce package of Kerrygold Dubliner cheddar cheese, which comes out to $6.50 per pound. That's a steal for grass-fed cheese, which is full of omega-3 fatty acids, lutein, conjugated linoleic acid and beta carotene. It's even more of a steal when we consider that Kraft Singles American Pasteurized Prepared Cheese Product (excuse me?) sells for $3.99 for a 12-ounce package at a supermarket near my local Whole Foods. That's $5.32 per pound for what, exactly? I would have a tough time calling it "food," and what nutrition could our bodies be possibly deriving from it? Surely nothing that you'll read if you click here, which describes the nutritional benefits of grass-fed meat and dairy products. In addition to Whole Foods stores in several states (i.e. New York, Massachusetts, Florida), Costco sells the Kerrygold cheddar at a similar (if not cheaper) price. Buy 10, keep them in your refrigerator (hard cheeses like this one have very long shelf lives) and tell your friends! 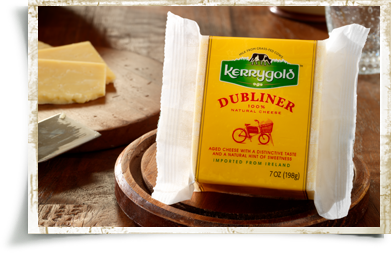 Thank you for telling me where I can get the Kerrygold Dubliner cheese. I had some on a trip but couldn't find it in the stores in our home town. It is the BEST cheddar cheese I have ever had. Costco here I come! It is fabululous! Just stumbled on it at local Wegmans in Rochester NY. They were sampling it near their gourmet/world cheese department. EPA to World: "Are You Ready for Some 2,4-D?"